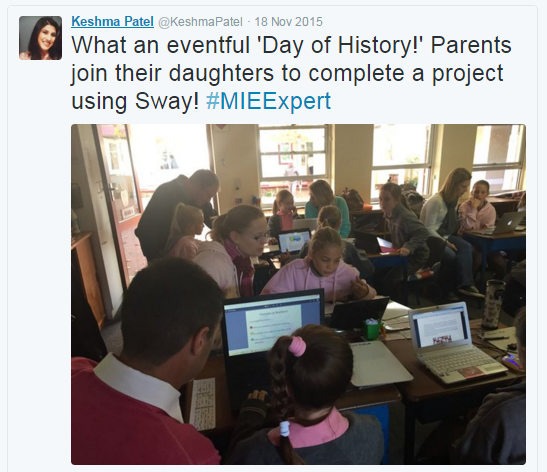 MIEExpert Spotlight #3: Keshma Patel - Project-based learning, 1:1 technology, student websites and Minecraft! Keshma’s amazing Grade 6 classroom! 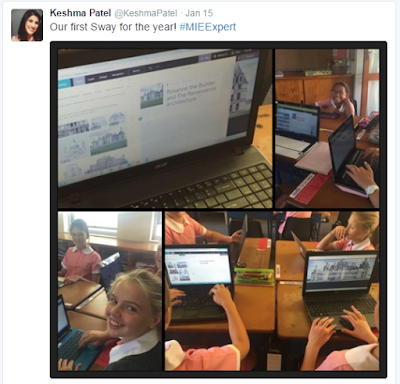 Keshma uses 1:1 technology, project-based learning and websites in her classroom at Micklefield Primary School. She is a keen user of Microsoft applications. Micklefield Primary is a small, private, girls' primary school situated in the heart of Rondebosch in Cape Town. This is no ordinary school but rather one that is alive with ideas and possibilities – and a school that is making great strides in showing a focus on technology integration. The Intermediate Phase teachers are encouraged to use the blended learning approach in their classrooms. 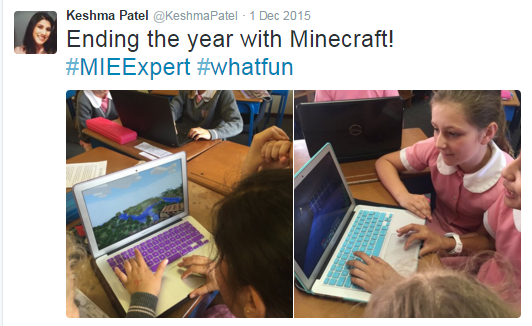 When Keshma joined the staff in 2015 she immediately encouraged her class to bring their own computer devices to school and she set up a 1:1 blended learning program. She says “After completing my first big blended learning project with my class, I was hooked. It amazed me to see how much information the girls in my class retained and how easy it was to integrate all learning levels and styles." Her class keeps evidence of their individual learning on their own individual websites they have created. Keshma keeps her class and parents informed via her website. You can visit Keshma’s class website called ‘Mrs Patel’s Classroom’ at http://bit.ly/1V9zzCM. A glance at Keshma’s Twitter account @KeshmaPatel shows her innovation in using Microsoft applications in her classroom. To summarise Keshma 's key technology, it would include Office 2013, Skype in the classroom, Office Mix, Sway and Minecraft. All these (apart from Minecraft) are available free, with tutorials and lessons available from the Microsoft Educator Community. At the end of last year Keshma decided to explore using Minecraft in her class. Minecraft is an open world game that was purchased by Microsoft in 2014. It promotes creativity, collaboration, and problem solving. It’s enjoyed by a worldwide community of over 100 million players who constantly inspire others with their creations. Microsoft has announced that the Minecraft: Education Edition will soon be released. Keshma felt that she wanted to use the world’s most popular game as a tool for learning. She says, “Minecraft was something that was being consistently talked about at break times and whenever the girls had a free moment in class. After having endless conversations with my class about what they enjoyed about it, hearing about Minecraft at various workshops and reading posts that were being shared among the MIEExperts, I decided to give it ago…I have never looked back! I was lucky that most of the girls had already purchased the game. There is a cost involved in order to download Minecraft. You can go to https://minecraft.net/ and follow the links from there. I paired up learners that had the game with those that did not and they completed tasks in this manner. Eventually as the interest grew, I found that the rest of the class had purchased Minecraft! I had to purchase Minecraft as well, and on occasion direct the girls using my personal computer and using my Smart Board." "I began the first Minecraft lesson by allowing the girls to play. I grouped my class into those that were experts with girls that had not played the game before. They spent the first lesson teaching each other and me. Once we got the hang of it, I started introducing specific themes such as Area and Perimeter, odd and even numbers and square roots. 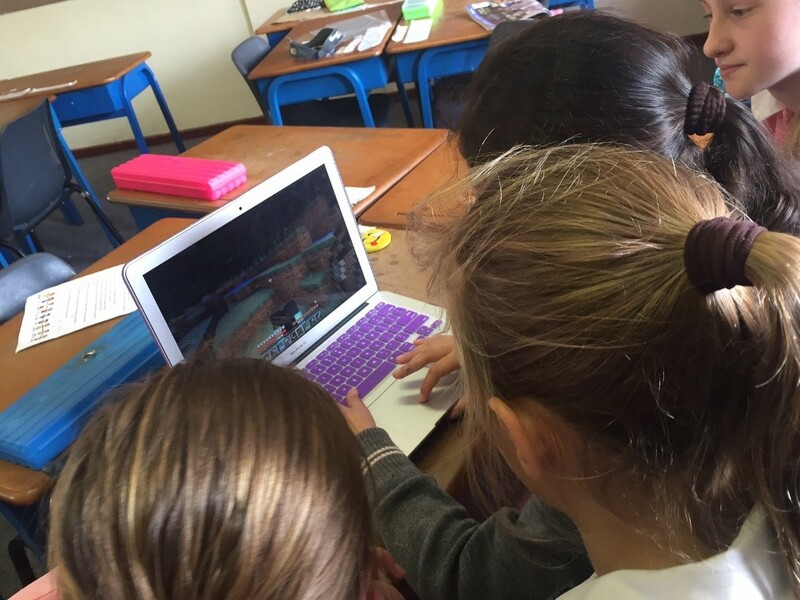 I allowed the girls to direct my teaching and I soon started finding more and more that I could link Minecraft with normal school activities. You can use it to introduce a topic, reinforce concepts that you are teaching or to develop certain skills. This week, we are re-creating a village from the Renaissance. This sort of activity is great as the girls have to research the architecture and the way of living." On a wider scale Keshma has created a termly meeting of twelve or more Grade 6 teachers from other schools in the Rondebosch area. At the next meeting on they will be sharing different ways of incorporating technology in their classrooms. There will be a speaker at this meeting and it is open to other interested teachers. The date is 25 February, 3-4:30pm at Micklefield School. Come along if you'd like to - just phone Micklefield to let them know! Keshma is currently completing her Masters’ degree at UCT on the topic of how the use of technology develops critical thinking and we wish her well in that. If you are a teacher who likes to be innovative in the classroom, think about entering Microsoft's Innovative Teacher MIEExpert program in 2017 when applications reopen later in the year. You can learn more about the program at this link: http://bit.ly/1H4gKcB It could lead to big things! After looking through all the Google posts that were shared to various subscriptions recently, these are 18+ that look useful for teachers. Video-making opportunities with Next Vista - why not get your students to enter? Next Vista for Learning (http://www.nextvista.org/) is a wonderful video sharing site directed at teachers and students. Videos on Next Vista are made by teachers and students for teachers and students. Throughout the school year Next Vista hosts video creation contests for students and teachers. The owner of this site is Rushton Hurley, a marvelous motivational education speaker who has been out to South Africa frequently to speak at various conferences for teachers. I have heard him twice at Google for Education summits. In January Rushton sent out a very inspiring newsletter with all sorts of opportunities, freebies and ideas for teachers. 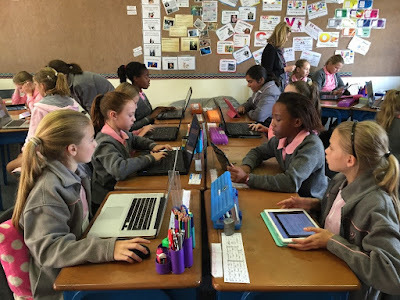 In this post I thought I would highlight two opportunities that teachers in South Africa might want to pursue with their students. 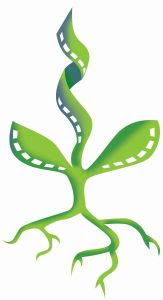 "Our spring contest, Creative Sprouts, is now in motion. As usual, the challenge for students and/or teachers is to creatively explain in 90 seconds or less something one might encounter in school. What your students make could help them better understand what you're teaching, help a peer figure out an important concept, or even allow your community to understand the good work being done at your school! "A number of teachers are getting their students geared up for our annual Service via Video project and contest. 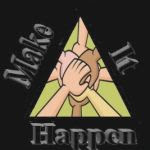 In it, we ask students to tell about people making their communities better, including researching charities (learning their stories, interviewing volunteers, and more) to create short videos (2 minutes or shorter) telling about these organizations. 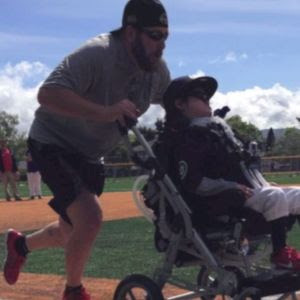 The charities highlighted in the videos chosen as finalists earn $200 toward the featured organization (see the rules for details). We'd love to help you help the students help those organizations, so please get involved! We want every student to know what she or he can do to help others with a little digital media work. The Next Vista for Learning is definitely a site to bookmark and visit regularly. Have you started your Grade 10-12 learners on the Microsoft Math portal yet? There is a great video on the Internet called: "Now Mathematics is like My Friend”. Take a look. Microsoft Math adds a social dimension to education, encouraging students to collaborate and compete with each other, and making the learning experience personal, engaging and exciting. Students can do thousands of math exercises, read theory, learn from examples, take tests, and more. Teachers can set assignments and homework for their class directly from the service, with the ability to better track students’ skill levels and to motivate them further. Provides an opportunity for students to collaborate with classmates and friends – or compete with them to see who can reach the top of the rankings. Helps teachers to improve their own skills and working methods. Teachers gain access to a rich exercise bank to ease class planning. The interactive system provides them clearer understanding of their students’ skills – and a new channel to communicate with and motivate them. https://education.microsoft.com/. There are so many useful lessons on the Community and there are probably numerous Maths lessons. Often, after a holiday break, teachers want to get their students writing about their holiday. A really fun way to do this is to get them to write their report back in Microsoft Word using a selected template. I discovered a great template for this in the fabulous Oakdome site.The template is in the form of a cell phone! I tried this out on a Grade 4 class and they loved the experience! "Describe, in around 200 words or less, one or two events from your summer holiday. You'll do this as though it is a phone message, so although your report back has a beginning, a middle and an end you won't use paragraphs. Add an image related to your story." We had a short oral session first about the holiday break and then we went to our computers to write in the Microsoft Word template. Two examples of the writing can be seen below. It would be great if one could also insert a voice recording of the learner reading their work into the document. I looked around Word 2013 but didn't see any way one do this. Word processing is an essential tool for any individual in today’s digital age and offline activities like these are a great way to start with young learners. For more lessons on how to use Microsoft in the classroom visit the Microsoft Educator Community at: https://education.microsoft.com/ and go to the Lessons page where you can search thousands of lesson plans created by educators for educators to help enhance teaching and learning. After looking through all the Google posts that were shared to various subscriptions recently, these are eleven that look useful for teachers. 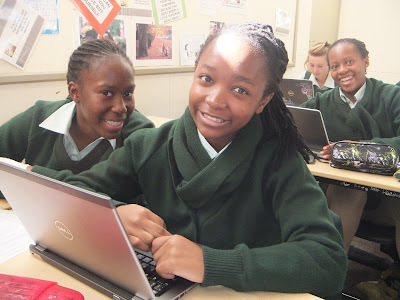 Brescia House School in Johannesburg is well known for its standards of excellence in education. It is a private Catholic school for girls that rates the use of technology as a high priority for all students at the school. The girls use different devices to suit the needs to the various age groups, for example iPads are used in the Foundation Phase; Windows 8 tablets are used in the Intermediate Phase and touch screen laptops are used in the High School. Brescia House is also a Microsoft Showcase school. As part of this program, the two principals from Brescia House School have had an opportunity to attend Global Microsoft in Education Forums. Benedikte Nott (Secondary School Headmistress) attended the Forum in Dubai and Ann Owgan (Primary School Headmistress) attended the Forum in Barcelona, Spain. Both found the Microsoft in Education forums to be valuable professional development and networking events. The two principals aided by Lyneth Crighton who heads up ICT at Brescia have done a good job of upskilling the staff at the school. So much so that this year a record number of 45 of their teachers applied for the Microsoft Innovative Educator Expert program (MIEE) in South Africa. No less than 16 of these teachers were successful. The teachers in the MIEE program in 2016 are all vying for a place to attend the upcoming E2 Global Teacher Exchange in Budapest in March this year. This will be the first of three posts featuring the Brescia House teachers who have earned the title of Microsoft Innovative Teacher Expert in 2016. In this post we will focus on five of the sixteen Brescia House teachers and display their winning entries. For the application one could submit a lesson or project using an online program such as YouTube, Microsoft Sway etc. Andrea Mitas is the primary school music teacher. She submitted a lesson called ‘Andrea Mitas Music lesson on Peter and the Wolf. This is a music lesson on the instruments of the Symphony orchestra using Peter and the Wolf as the theme. Ashley Roberts, a Creative Arts and Music teacher at Brescia, submitted a Grade 8&9 Advert project video called 'Using software to create and present'. The students used a range of software applications including PowerPoint, Audacity and Movie Maker to create and then present a 30 second advert for a product around a theme of Roaring 20s (Grade 9) or Water (Grade 8). Catherine Mullen is a Grade 2 class teacher at Brescia House. She believes that technology is preparing learners for the ever-changing real world. She wants to encourage a mindset of life-long learning in her students. With all the resources available to her at school she is able to give her learners up to date information and they are able to discuss current affairs, explore places they may never see and much more. Catherine submitted a video called 'Mathematics Innovative Lesson'. Charmaine Caine is a Grade 4 teacher who is enjoying her quest to find new and innovative ways of engaging her girls in learning experiences. Her video, called Innovative Teaching, shows one of the themes she experimented with this year that empowered her girls to use ingenuity, creativity and technology. Graham West is a Grade 8 - 12 History teacher at Brescia House. He submitted a Grade 9 History project called 'Creating a Facebook page for a historic personality'. His focus on technology is using it to enhance learning in a blended way together with more traditional teaching methods. Well done to these teachers for their very inspiring lessons. If you would like to find inspiring lessons from global teachers please join the new Microsoft Educator Community at: https://education.microsoft.com/ and go to the Lessons page where you can search thousands of lesson plans created by educators for educators to help enhance teaching and learning. This is the fourth in a series of posts on using avatars in the classroom. My students use avatars for various purposes such as uploading a profile picture to their Edmodo profile, Google classroom profile, Gmail profile, blog profile etc. In this series of posts we will look at these various avatar creation applications in more details. Previous posts can be accessed by clicking on the avatars tag on the blog here http://goo.gl/72Q0cu. Today we look at Be Funky. BeFunky is a picture-editor app for Web platforms and mobile devices. Best is - no registration is required Just take your picture, add some crazy effects, and share it online. This avatar creator requires actual photos. Before the lesson starts make sure that you have taken a portrait photo of each student and that these are uploaded to a place where they can access them easily. Be Funky can be accessed at https://www.befunky.com/create/. When students open BeFunky they’ll see the landing page that asks you to upload a photo. You'll notice that you can upload from different places. In my case the photos were stored in a shared folder in Google Drive. You'll notice all sorts of icons at the side but the one I used with the class was the ARTSY one in the very left column which has a flower icon as shown in the diagram below. The ARTSY section gives so many great options. My class oohed and aahed as they tried them out. Some are paid options but there is a lot of free stuff as well. As you explore all the items you can easily save your choices. All you do is click on the Save icon and download to wherever you would like it. For my students I wanted the pictures saved in the same folder with their name and a number next to it. The class had a lot of fun creating avatars in this lesson. Some of them told me they went home and showed their parents how to create avatars. This YouTube tutorial will take you through how to use all the different features of BeFunky. The main way that I use avatar creation in the younger classrooms is for teaching basic ICT skills. I usually don't use photos for this. With the older classes we create avatars to use on various online sites and applications that we use in class, for example: such as Gmail. Edmodo, Classroom etc. where one wants a profile picture to be more cartoonlike. Try BeFunky. I am sure you'll love using it! Microsoft has recently launched the official Learning Tools for OneNote (Customer Preview) add-in. It can be downloaded from http://www.onenote.com/learningtools. The Learning Tools for OneNote add-in helps everyone improve their reading and writing skills, including gifted learners, students with learning differences or a combination of any of the broad range of unique student abilities. "Students spend so much energy decoding that they can't focus on content. This tool will help making learning more efficient." Some of the top Dyslexia leaders in the US, Drs. Brock and Fernette Edie have recently posted a blog naming Learning Tools the first “top Dyslexia app of 2016”. They run the largest Dyslexia community in the US and wrote the book The Dyslexic Advantage. The potential to help people with Dyslexia is enormous. If you are are at the BETT conference in London this week you can see Learning Tools being demonstrated to teachers and school leaders from around the world. Create a lesson or browse existing lessons plans, virtual field trips, or live lessons. 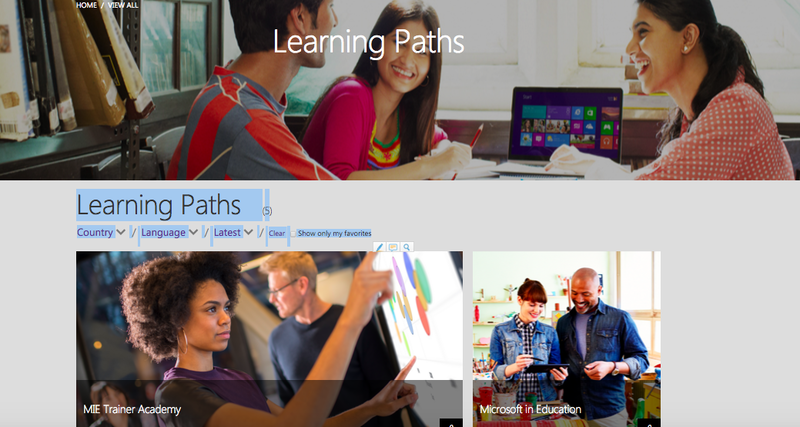 They have moved select learning activities (now called lesson plans) and tutorials (now called video tutorials) over from the previous Microsoft Educator Network. Learning activities and tutorials that are not part of the initial move would need to be brought over to the new site by individual lesson owners. Let's go back to the landing page of the new community once you have signed in. You'll notice six options in the image, so let's take a look at those. Today we'll start our exploration of this great site and look at the Get Trained option. This section aims to enable you to stay current with the right mix of student-focused technology, experiential learning, and virtual collaboration to help your students learn and grow. You'll see it includes three subsections namely Quick Tip videos, Courses and Learning Paths. There are 37 Quick Tip videos to help you with some technology that you are wanting to know more about using in your classroom. As the name suggests they are short videos of around 3 minutes that are easy to follow. The topics are extremely inviting. A look around the courses section shows that there are nine very inviting courses on offer at the moment, all free. They aim to help you find that immediate training you might need on a tool. They are beautifully set out and are easy to follow. Learning paths are a compilation of courses or resources that help guide a learner to develop a strong knowledge base for a product or a topic. These would be more intensive courses. c) Teaching with Technology: The Teaching with Technology (TwT) curriculum is designed to help educators understand how Information and Communication Technology (ICT) can enhance the teaching and learning experience and enable students to acquire 21st century skills. Among many benefits, Teaching with Technology is free, aligned with the UNESCO ICT Competency Framework for Teachers, and self-paced (log back on at any time to pick up where you left off). d) 21st Century Learning Design: 21st Century Learning Design (21CLD) for Educators is a collection of 8 courses with 4-6 lessons in each course. This learning path provides teachers with clear and practical ways to develop 21st skills using digital technologies with their students. Through a collection of Office Mix Lessons, 21st Century Learning Design for Educators builds on the research methodology providing a collaborative, practice-based process to help educators transform how they design enriching learning activities for their students. The complete series of 8 courses consists of 20 hours of Office Mix Lessons, video and self-assessment materials. Educators have the opportunity to actively participate in the course by sharing their materials and by engaging in ongoing discussion as part of a community of learners. ICT tools that support student assessment needs at different stages of learning. Tips to use the internet more effectively to support learning. Time saving productivity tips for you! Why not head over to https://www.educatornetwork.com/, join if you haven't yet joined and take a look around. You'll be amazed. After looking through all the Google posts that were shared to various subscriptions recently, these are thirteen that look useful for teachers. Rate us (SchoolNet) on SchoolAdvisor and be in line to win a trip to Mauritius! "SchoolNet is now listed on the SchoolAdvisor website. This is a new online platform that brings schools and suppliers together, by hosting an ever increasing base of school suppliers and the services that they offer, and allowing schools to search for, get quotes and rate suppliers directly. We believe that this platform will help you to find the best supplier or product for your needs, and ensure that you receive the best service - as suppliers are kept accountable by constant review and feedback by school decision makers. "As part of their launch promotion, SchoolAdvisor is offering you the opportunity to win a weeklong vacation for two to the 4-star Le Mauricia Hotel in Mauritius - absolutely free. All you have to do is rate a supplier. We would love it if you could rate our company and services, as it is important to us to have feedback from our clients and to stay up to date with their needs. Every review counts as an entry, so please rate us and other suppliers you have worked with. "We look forward to your feedback and comments! Click here, select 'review a company' and write your first review." Take some time to join the new Microsoft Educator Community today! In around October 2015 Microsoft moved the Microsoft Educator Network to its new destination now called the Microsoft Educator Community. Have you perhaps visited the new site and joined? What is the new site about? If I belong to the old Network with I automatically have a profile on the new Community? This post will answer that questions and help you get started by outlining a few steps that will help kick-start your engagement with the new educator community. Click on https://www.educatornetwork.com/. 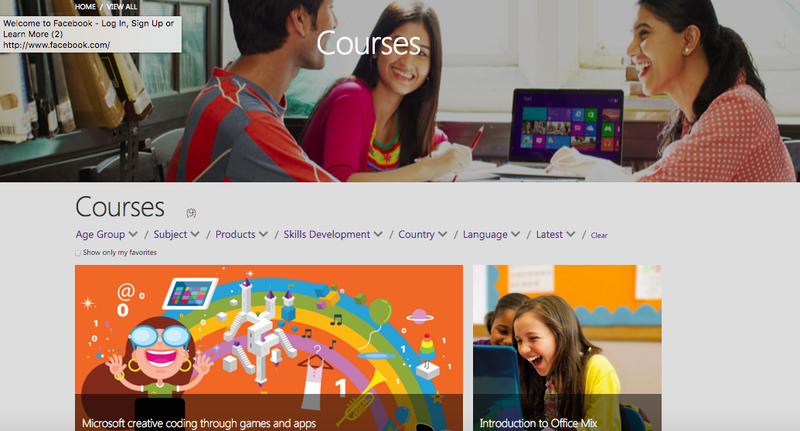 This page will take you to the new Microsoft Educator Community homepage. You'll notice that there is no Sign Up option if you are new to the Community. There is only a Sign In option. Click on that one. There are quite a few options for signing in. You can select from Office 365, Microsoft (i.e. windowslive.com) Skype, Facebook or Twitter. If you are a previous member sign in with the same email that you used before. Sign-up on the new site by creating a profile if you have never signed up before. Current Microsoft Educator Network members may be prompted to provide the necessary verification to pull your profile data over. 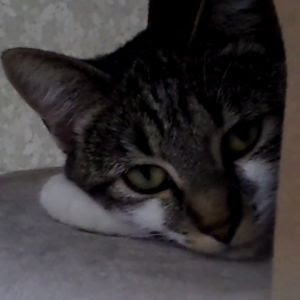 I found a rather odd photo on my profile even though I was a previous member. Update your profile to depict your expertise and make it easier for other community members to find and connect with you. Some of your details will have been moved across but possibly not all. I found that only two of my badges have been moved across. But on closer look I see the words 'Recover account' at the bottom of More About Me! That looks useful. However after clicking on Recover Account I get taken to a page that says that if you are using a different email address you might want to recover your previous information. My email address is the same as it was! At this point update your profile and fill in any missing details. You'll see a number of options available on the site. 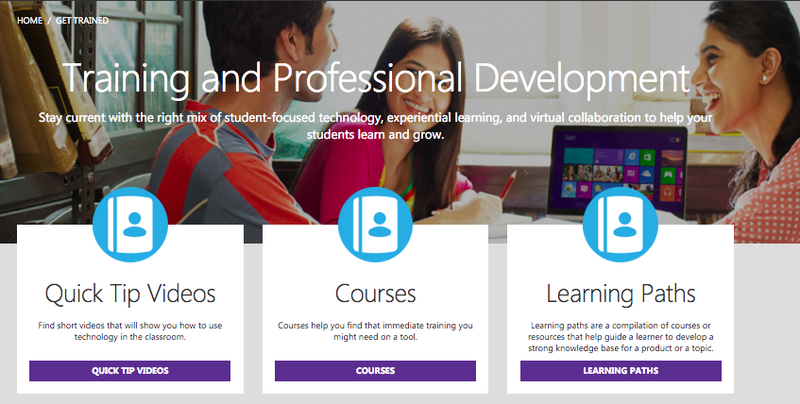 We'll look into these options in the next post on the Microsoft Educator Community. 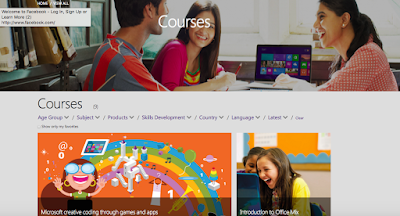 Visit Microsoft’s educator community today!